BOSTON, June 17, 2016 PRNewswire - Zymo Research Corp. has announced a suite of products that address workflow, from sample collection to data analysis, for microbiomics research. The rapid growth of the study of microbiomes has increased the demand for standard methods to improve the reproducibility and quality of the data being generated. Coupled with the recent announcement by the White House about the formation of the National Microbiome Initiative (NMI) this demand should increase even further. Biases inherently exist at every step of the microbiomic workflow, including collection, extraction, and sequencing techniques. Therefore, there is a great need for the adoption of reference materials and standard methods in order to identify and eliminate measurement bias. To solve that problem, Zymo Research has developed the ZymoBIOMICS™ workflow suite to aid researchers in obtaining the most accurate and unbiased data from sample collection to analysis. The epigenetic clock can be used for forensic, consumer or academic applications. Dr. Graham Threadgill, Vice President of Global Marketing at Zymo Research said, "The Horvath Clock is an important part of Zymo Research's aging program. We plan to commercialize products in the future based on the epigenetic clock and other related markers. We are excited to be at the forefront of this new field of research and look forward to expanding Zymo's presence in the field of epigenetic analysis." 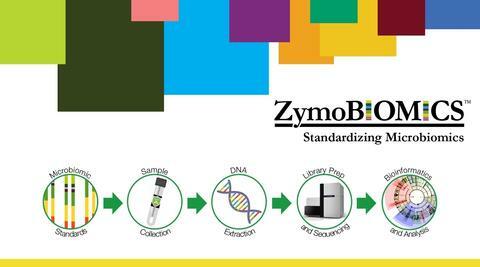 The suite of ZymoBIOMICS™ products addresses the complete workflow from sample collection to DNA extraction, from library prep and sequencing through bioinformatics and analysis. Beginning with sample collection, bias can be eliminated using DNA/RNA Shield™, which preserves nucleic acid samples for up to one month at room temperature while inactivating any pathogens present in the sample. Community standards are run in parallel with the DNA extraction step. ZymoBIOMICS™ Microbial Community Standards contain three easy-to-lyse Gram-negative bacteria, five tough-to-lyse Gram-positive bacteria and two tough-to-lyse yeasts. These microbial standards contain less than 0.01% impurities and are accurately characterized, which enable the exposure of artifacts, errors and bias in microbiomics or metagenomics workflows, specifically 16S rRNA and shotgun sequencing. In addition to the microbial standards, Zymo Research offers low-bioburden DNA isolation kits that have an innovative bead and buffer system. The Library Prep and sequencing workflow step is addressed with ZymoTaq™, a low-bioburden polymerase and PCR prep-mix preparation. For bioinformatics and analysis, Zymo Research offers ZymoBIOMICS™ Services for 16S rRNA and metagenomic shotgun sequencing. The services validate data using the ZymoBIOMICS™ Microbial Community Standards. Services include low-bioburden processing and accurate DNA/RNA isolation using the ZymoBIOMICS™products for taxonomic profiling. To find out more about Zymo Research's ZymoBIOMICS™ suite of products and/or to get a free sample of ZymoBIOMICS™ Microbial Community Standards and DNA Mini Kit, go here. An on-demand webinar is also available that provides information how reference materials improve the quality of data generated from microbiomic studies. Go here to view. All trademarks are the property of their respective owners. Zymo Research Corp., the stylized logo, tagline "The Beauty of Science is to Make Things Simple", ZymoBIOMICS, DNA/RNA Shield, and ZymoTaq are trademarks of Zymo Research Corp. and are registered with the USPTO.